Installing new landscaping or making improvements to existing features is a major financial investment. There is great potential to increase the value of your home and to create a more enjoyable outdoor environment for you and your family to spend time in, so it's important to choose the right company for the job. 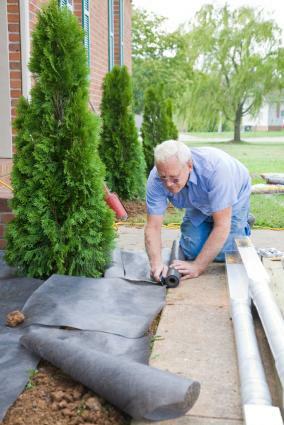 The first step in finding a landscape contractor is to determine what your goals are. Most contractors specialize in certain areas, so it pays to look for one that is an expert in what you need to have done. Some are hardscape specialists, focusing on building decks, patios, driveways, fences, and retaining walls. Others are focused more on the plantscape and may specialize in lawns, Japanese gardens, edible gardens or any number of other garden styles. If you don't know what you want, start by hiring a landscape designer to help you come up with a plan. When reaching out to a landscape contractor, don't hang up the phone until you've asked them if they are licensed and insured for the type of work that you are requesting. Most states have a professional licensing program for landscape contractors, in which case it is mandatory that they be licensed. If this is not the case in your state, ask about their training, any certificates or degrees they hold, as well as their membership in professional landscape associations. Before you hire anyone, ask for a copy of their insurance binder and license and call the number provided on the documents to verify their validity. Asking friends for referrals is a great way to start, but you can also keep your eyes open for newly installed landscaping as you drive around town and attempt to find out who did the work. Often, the landscape company will post a sign in the yard they have just completed advertising their phone number and website. Local nurseries are also in the habit of recommending reputable contractors to their customers. Contractors generally will meet with you at least once free of charge to discuss your project and many give free estimates. While contractors who have been in business for decades have experience and reputation behind them, new contractors with just a few years of experience may have fresh ideas and potentially cost less as they are just starting out. Find out the contractor's experience level with the type of project you have in mind. This is just as important as their overall experience in the profession. The more specialized the project is, the more you need to check their credentials for doing that type of work. This is where you will really get a sense of the person you're dealing with and their competence with the type of work you desire. Someone who answers with great detail and a clear passion for what they're saying is likely to be a great match. Inquire whether they would need to hire subcontractors to complete any portion of the work. Ask how problems with those contractors would be handled and how this affects the final budget and timeline. One or two subcontractors for truly specialized areas may not be a red flag, but multiple subcontractors for one job may be a sign they are not as knowledgeable or experienced as advertised. Landscape contractors should be well-versed in what does and does not require a permit. In most places, this includes decks and fences, sheds, gazebos and pools. Their familiarity with this aspect is a good sign of how experienced they are. Don't hold them to it, but you certainly want to have an idea of what the bottom line will be. Ask what they have charged for projects of a similar scope in the past. A major landscape installation can really disrupt your life - the yard will temporarily look like a bomb has gone of, the driveway may be blocked, it can be noisy, workers will invade your yard. In short, it takes over your life and you want to know that they are flexible and communicative enough to work with you on your scheduling needs and that they will start and do it until it is done, without taking a break for two weeks in the middle to go do another job. Things like decks, patios and irrigation systems should come with some sort of warranty for defects in craftsmanship and improper installation. Plants are less likely to be covered because they are subject to weather, pests, disease and other forces outside the control of the contractor. Just make sure they are clear about what is and is not covered. It's ideal when the same company that installs the landscaping can also maintain it, because they will be aware of all the little details that a newcomer will not. However, if they don't offer maintenance service, it's no reason to not use them; it's just good to know up front. Listen to their responses and try to get a sense of their overall personality, professionalism, and competence. Trust your initial gut feelings, but also make sure to get numbers of past clients to serve as references. You may choose to request a formal quote from as many of the candidates as you feel confident about - don't waste your time with any that make you feel uncomfortable or behave overzealously in attempting to sell themselves. Ultimately, go with the lowest price, best qualified candidate whose references confirmed that they are able to complete work in a timely and professional manner. When you receive a formal quote from the contractor, look over it carefully and read all the fine print. It should cover the entire scope of work involved in step-by-step detail, from initial clearing and grading to the final clean-up, including the removal of debris. Ideally, each step of the project includes numbers for labor and materials specified in the contract. It should also specify that the contractor will be responsible for obtaining any necessary permits, unless other agreements have been made in advance. The contract should also spell out a timeline for the project, and include a payment schedule. Has the contractor demonstrated that they have the experience and qualifications for every bit of the work involved? Do they seem like they will be friendly and enjoyable to work with and offer responsive customer service during and after the installation? If the answer to all these questions is yes, you have probably made the right decision on who to hire and should rest well knowing that you have turned over every stone in the process. In a short time, you will be enjoying your new landscape!